First, I wish you all a Happy New Year ! The last few weeks I have been very diligent. But now, I need some Measures to finish the sidewalls. I would be glad if you had some information. I have the dimension for the total tiller height (I do not have distance A in your picture). The center of the tiller axle is 57.5 cm from the bare cockpit floor. Hallo Marc, thank you for answer! 57,5cm viewed from insinde looks perhaps a little bit too deep. Is it possible, to get the measures from inside (the yellow arrows)? My dimensions from sidewall are approximately +/-1% by the originals. Thus, I expect a good result from measures from inside. I envy you for your real cockpits ^^. only chance for me to get: go to EDFH and dismantle a parket B738 from Rynair....Tony Ryan has enough of them. "sorry" for the inconvenience, I´ll try as real as possible. I want to show you one of my modes of operating if I have no or no real measures. I only need a good photo with ruler...that's all the help I need, nothing spectacular. In this way I am 100% on original. so, a small photo spared massive work. thanks to all, who make it possible. If you can wait until next week, I'll take measurements from a real NG. 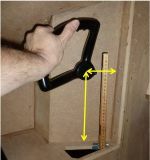 57,5cm is the correct measurement from the bare floor to the center of the tiller axle. Measured from real 737-600NG, alas, not mine! I do not know how this translates to your setup, that is something you will have to compare and adjust as necessary. ~57cm is definitly the correct measure. I now have all what I need to finish the sidewalls. thanks a lot to all ! the next phase of construction: fill in. Page created in 5.608 seconds with 27 queries.